2017 Edit: There is an updated version of this article >>here<<. If your machine had an Ametek motor fitted, you can fit a YDK type motor with ease. 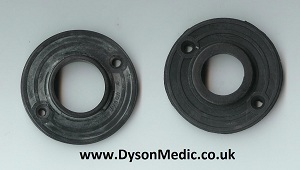 Just be sure that you get the YDK rubbers and the plastic retaining ring to go with it and you are good to go. No other modifications are required. You simply fit the YDK motor together with the replacement fan-case seal, top rubber and plastic retaining ring when you reassemble. If you need a new motor for your Dyson DC04, source it from a Dyson specialist. This will ensure you get a quality item from a trusted source at a great price. Below is a link to who we recommend. You can order a YDK motor for £35 including UK delivery. If your machine had an Ametek fitted, they will even throw you the extra rubbers and plastic ring in for free! This entry was posted on Monday, February 7th, 2011 at 5:03 pm	and is filed under Dyson DC04. You can follow any responses to this entry through the RSS 2.0 feed. You can skip to the end and leave a response. Pinging is currently not allowed.